We know a thing or two about sushi—okay, this is a bit of an understatement. Let’s try again: we love sushi, and we have devoted an incalculable amount of time to perfecting the art of making it. This devotion, however, has not been for naught. Over the years, we have built a loyal base of patrons, and we have earned a reputation for serving up some the best sushi in Charlotte. Though we live, eat, and breathe sushi, we know that this isn’t the case for everyone. Some sushi menus present a staggering number of options and trying to settle on one you feel good about can be quite a struggle. In today’s blog, we would like to welcome you into our sushi world by explaining some of the common types. If you are in the Charlotte area and craving seriously good sushi, stop in and see us! View our menu and contact us with any questions. For most people, when they think of sushi, they are actually thinking of maki—i.e. fish, vegetables, and sushi rice layered and then rolled up in seaweed. Maki is traditional sushi, and it can be served cooked and or raw. Additionally, if rice is on the outside, it is uramaki. And if everything is scooped into a nori (dried seaweed) cone, it is temaki. Like maki, nigiri is another type of sushi. However, unlike maki, nigiri sushi is not rolled. Instead, the thinly sliced fish—either raw or cooked—is set atop a mound of vinegared rice. In between the rice and fish, sushi chefs will often place either a small amount of wasabi or toasted seaweed. 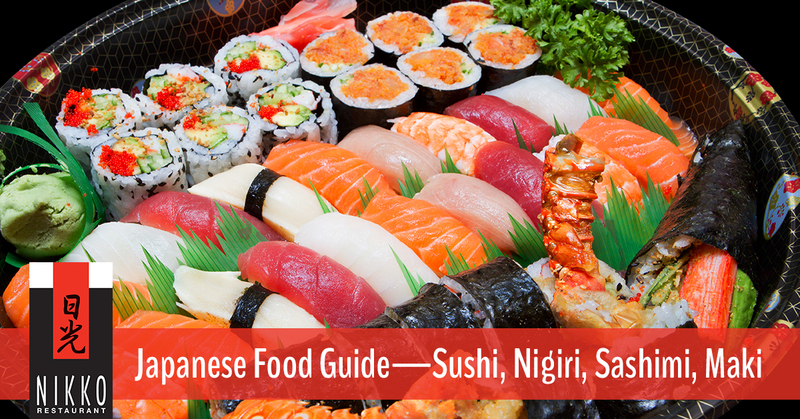 The name nigiri translates to “two fingers,” which is roughly the size of the rice portion. Looking for the best sushi in Charlotte? Come on down to Nikko Restaurant! Our sushi menu includes nigiri, maki, temaki, platters, and more. We also have a variety of sashimi, specialty creations, and other traditional Japanese foods.